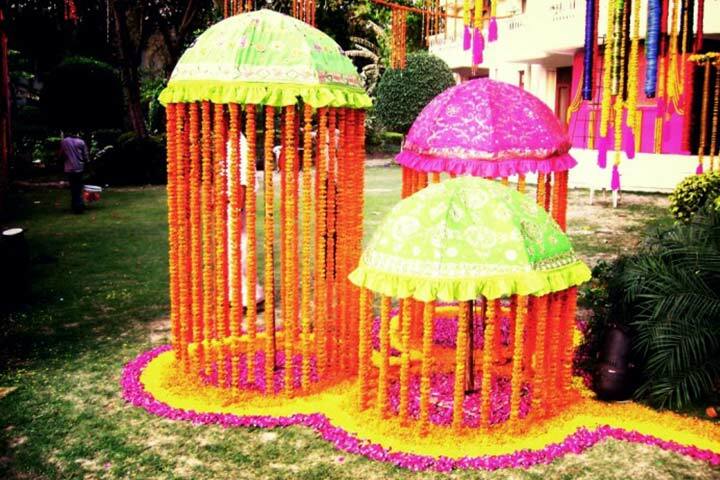 Stunning Wedding Decorations: 8 Ideas to Die For! Wedding decorations are always one of the most fun and entertaining parts of any wedding ceremony and accompanying function. 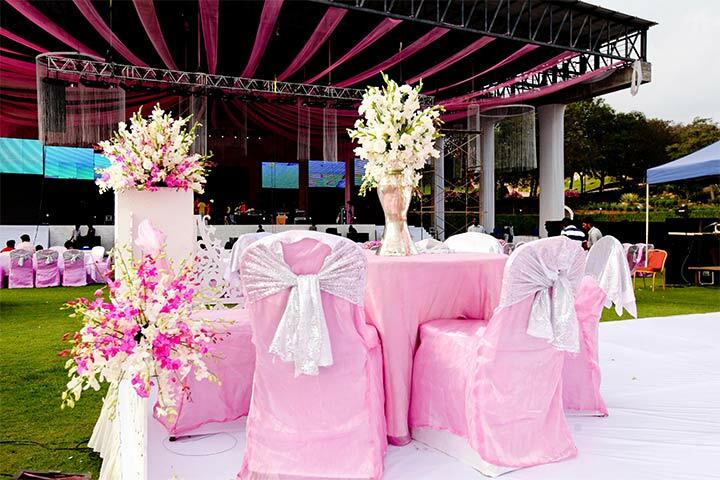 Whether they are done by professionals or put up by you and a few dedicated helping hands, it is always the disparate elements of design that make up the whole of the wedding decor. A direct reflection of your tastes, the decorations and ambiance of your wedding are a platform for the world, vis-a-vis your guests, to see into your sense of style and aesthetic. 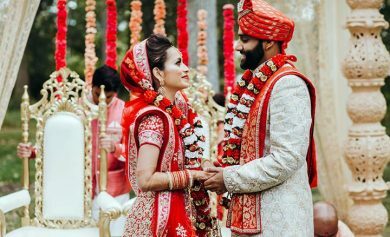 Traditionally, always a grand affair, it has become even more of a grandiose entity since the couples themselves have started getting and taking more active parts in the planning and execution of their wedding ceremony and reception. 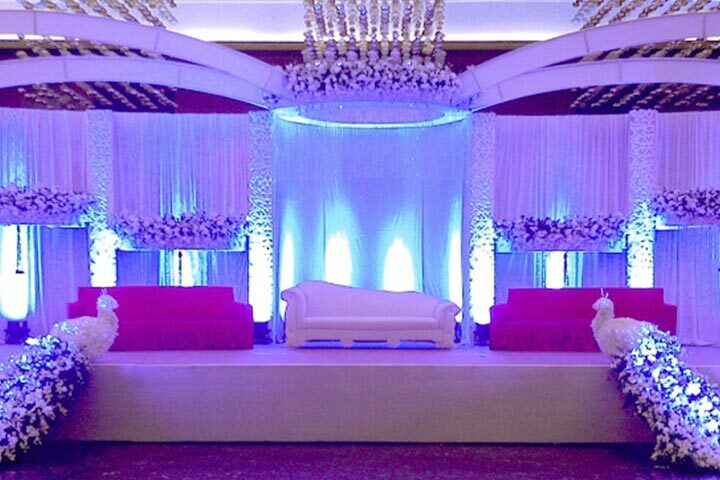 And while it is indeed possible to plan, coordinate and even do a lot of the decoration yourself, especially for smaller, more intimate ceremonies and function, it is always advisable to hire a professional wedding decorator, so that you can get some expert help and even some great tips, advice and ideas that you wouldn’t have thought of otherwise. To aid you in planning your own wedding decorations, we’ve compiled a list of some stunning examples of wedding decorations done right. These fabulous instances of decor will blow you away with their inspired innovation and sometimes downright quirkiness. After all, the wedding decor is for the ambiance that you want to create for your most special of days; go a little wild and go a little crazy. Sanity is overrated. Scroll on! Floral arrangements are always a customary part of wedding ceremonies and functions for a very simple reason. They are beautiful and tastefully add to almost any ceremony or venue. The aesthetic potential of even a simple flower arrangement is enrapturing in its floral appeal. Here, pink bunches of roses are utilised to perfection by being offset by the clear transparency of the glass blocks. The juxtaposition of the antique pocket watches, all in burnished bronze, with their looping chains is also superbly done. 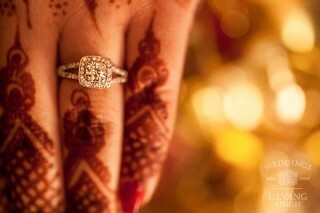 The hands of the watched can be set to show the time when the more significant events of the wedding itinerary are supposed to be. Or, and this is our personal favourite, you could just remove all the hands entirely, making it a frozen moment in time. Again going back to the sheer appeal of flowers, here is a tasteful arrangement that is accompanied by complementary choices in tablecloth and chair fabric. The table centrepiece if also particularly striking, being set in a plain but shiny vase. We like to make our point clear, and what more reason do you need to believe in the power of flowers than this? A simple, but highly effective and beautiful and artful pile of flowers is boundlessly effective. Borrowing the visual power of a floral arrangement, this clever little adaptation is a multi-tiered lotus shape that is enriched with coloured sand. The vibrancy of the colours is highlighted by complementing shine of the brass. This kind of decoration is obviously dependent on the venue, but doesn’t the idea of a floating pontoon bridge which is supported by traditional canoes sound lovely? The floral and fabric arches on the bridge only add to the appeal of the idea. 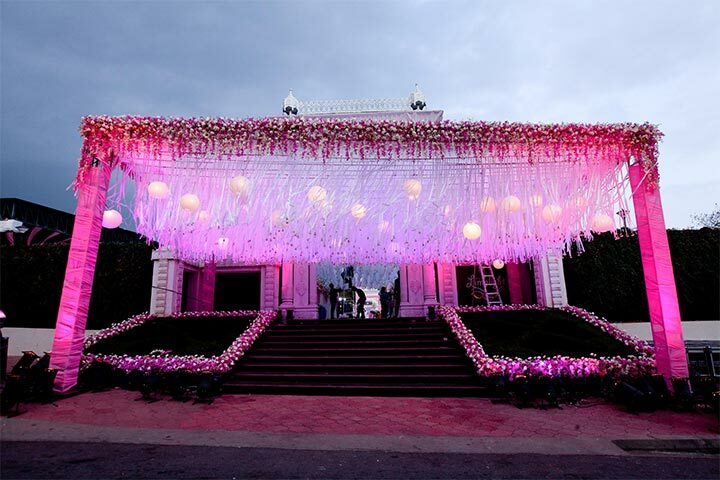 If you are holding your ceremony outside, you can always deck up the premises with all sorts of floral decorations in a wide range of patterns and designs. 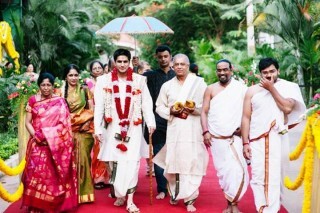 You can have a carpet of red cloth leading up to your function and line it with streams of flowers. A wedding arch that is finished in tones of lilac, with a crown of flowers at the top with dangling beads and crystals to offset the upward arch. Simple and artful. You can never have enough flowers at a wedding ceremony. Add more floral accents to the event by placing some carefully chosen flowers in hanging pots or holders, and dangle them off the chairs at the ends of each row. 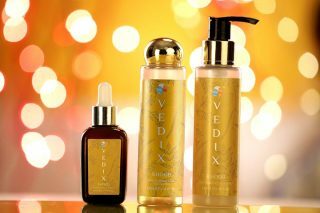 Anything from lilies, hydrangeas, peonies, thistle to jasmine can be used. You can even consider using orchids if you have to moolah for them. Centerpiece decorations on the tables near the buffet are always nice ways to add to the look and feel of the event. The more elaborate they get, the more they’ll take out of your pocket and add to your memories. If you have a nice, sturdy and appropriate tree somewhere within the premises of your venue, then why not add a swing? You can decorate it tastefully with some flowers, and it will also be a tremendously fun element to your decor. It’s also rife with potential photo opportunities. Part of themed decor, this setup is near the table where people figure out their seating tags and other arrangements. The cut-out letters that spell out love is brilliantly accentuated by the numerous dainty cut flowers. A larger exploration of the same theme, these large reminders will keep everyone in the know of the main mood in the air. The added frames and flowers give it a nice touch. If you have a lot of wrought-metal work at your venue, you can spruce them up with garlands of flowers. 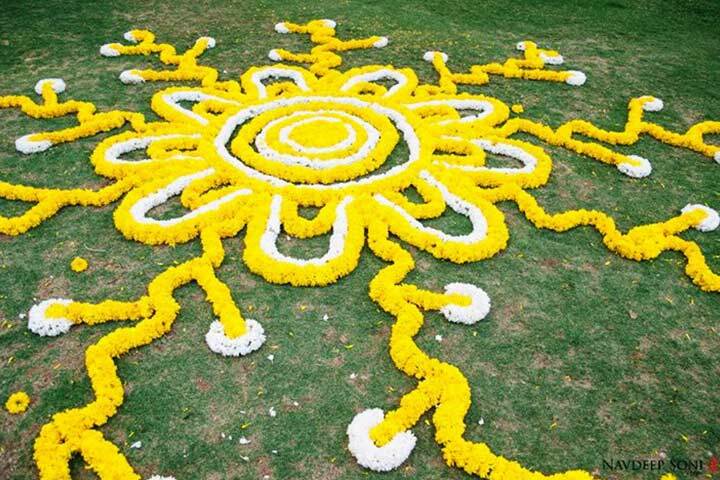 Marigolds work beautifully for this purpose. These beautiful flower arrangements will wow your guests and set your tables straight. The flowers contained by the simple cage without any gilt at all is wonderful method of presentation, while the artful presentation of the bouquet in the ochre vase is also particularly lovely. Small little umbrellas that have been adapted to make small pandals that are hung with streams of flowers that rest in a puddle of petals. For lovers of the rainbow, this spectacular spread of colours using loose sheets of cloth and multiple rainbow umbrellas is a perfect choice. The performer on stilts comes extra. As does the kid. 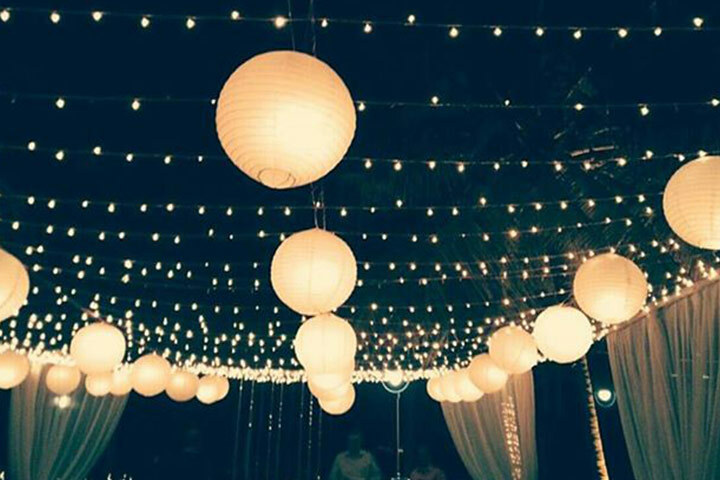 Using lighting effectively to highlight already existing beautiful elements at your wedding venue is a smart way to go about completing your decor. This one is for those functions that happen in the latter half of the day, light up the path to your venue with fair lights and effective spotlights to spread a diffused kind of glow to the whole ambiance. 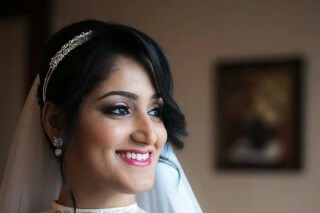 The godsends that are fairy lights are loved by wedding decorators because of their versatility. 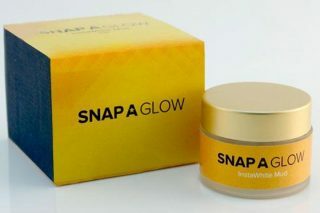 They can be used in hundreds of ways to achieve a lot of desirable effects. Candles and lights are always winning decor elements, especially if presented in stunning little lanterns and holders or cups. This wonderful presentation of tiered candles in a cage holder will light up your event. Another example of tiered candles in a holder, this time it is accompanied by strings of dangling flowers. A host of simmering candles lending their light to your function, veiled behind intricate holders which throw lovely shadows of light are always winning elements of decor. An elaborate exploration of hallway decoration, replete with lights floral decorations, including ones that are dressed up to look like nesting peacocks, this is a simply gorgeous thing to do for your wedding. One must always travel in style, especially on one’s wedding day. 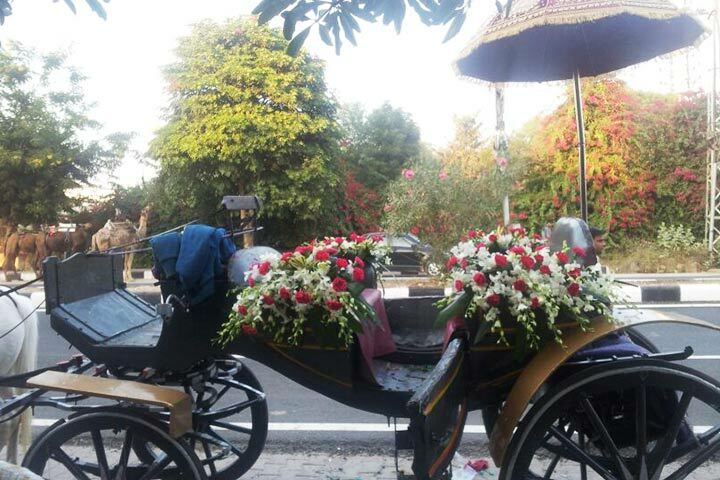 Go the classic route with this horse-drawn carriage that is decked out with lovely flowers and a royal looking umbrella. If you have enough money to get or rent a Rolls Royce to carry you away from the function, then you have to deck it up. A car of such distinction and sophistication, bursting with aesthetic perfection in every line, is obviously screaming out for more adornments and embellishments. Especially in the form of a jalar with attached floral designs. Obviously. A vintage car decked in classy flowers for a suave couple. What better combination. You can add an appropriately brightly coloured pandal which can be a bangle table. This allows your guests to deck themselves up in myriad colours of bangles, and add to the general vibrancy of the ambiance. 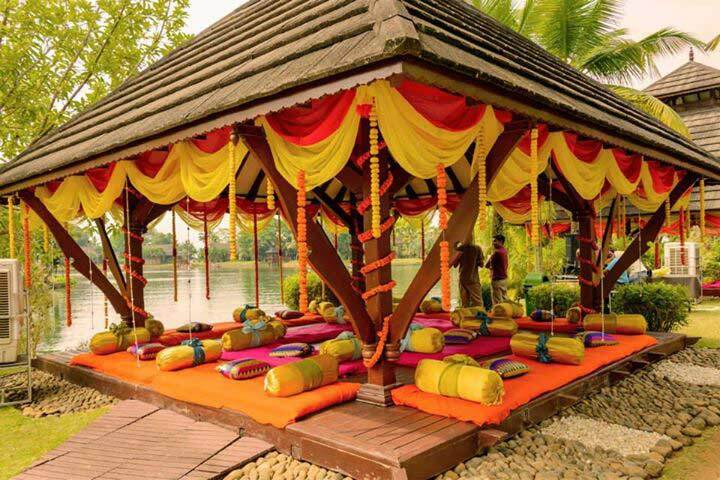 You can have a separate pandal for the mehendi ceremony. With low-lying beds, cushions and gaddas aplenty, you will bask in the abundant repertoire of colours while being supremely comfortable. 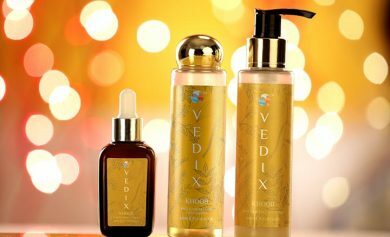 You can also arrange the packets of mehendi in artful ways that will add to the decor. You can always have a candid photo booth filled with all sorts of odds and bits that will add pizzazz to your wedding photo shoot. 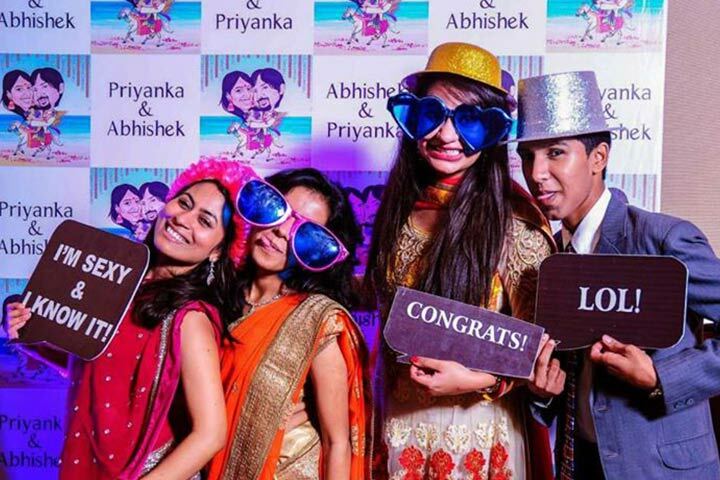 Fill it up with a variety of colourful frames and quirky objects like a pull-rickshaw with streamers on the handlebars to add oodles of zany fun to the proceedings. A themed desert counter, it carries delectable delicacies for every gourmand’s tongue while looking stunningly beautiful. Hang up empty frames, with all of them being skewed in relation to each other, to create an out-there and ephemeral look. 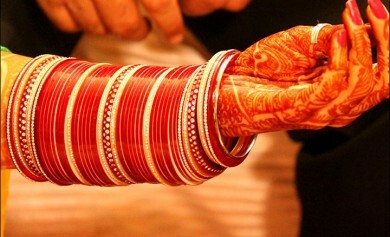 Bangles can be used in many ways, not just to make your wrists look pretty, but to add the decor in surprising ways. This gorgeous table decoration will revitalise your wedding with its zesty fresh oranges. If you truly want to be extravagant, go for stylised wreaths of flowers and succulents to hang on the back of your guests’ chairs. There is no such thing as junk, just separate elements that can be assembled to create a very pretty picture. Truly classy, this stack of vintage trunks and suitcases has been artfully appropriated to serve as a platform for the new imminent newlyweds to launch their nuptials together in fine fashion. 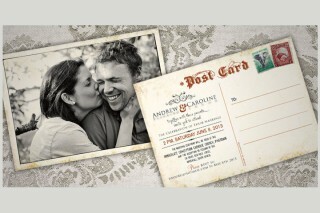 Add a bit of fun to the proceedings by having cartoon avatars of you and your partner greet your guests to the venue. 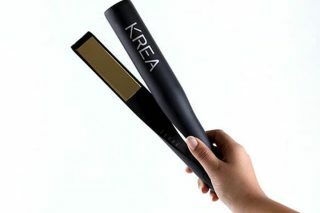 If done tastefully, it will leave a more than lasting impression, indeed, you can even become an inspiration! This is an example of effective utilisation of the backgrounds offered by the venue coupled with stunning backdrops and facades to create an almost Moroccan air. Add in some complementary low seating and cushions, throw in an elaborate hookah pipe and you’re set! Using curved seating is always a nice idea, as it throws in a difference to the function. With many different options available, you will have a range of conversations and interactions happening. The accompanying hookah may or may not be functional, that depends on you. 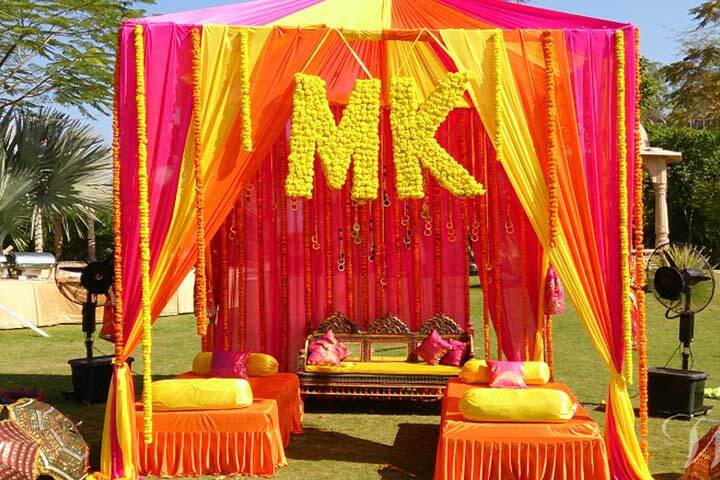 You can make little tents and pandals with multi-coloured cloth to create dazzling arrays of fabric. If you are having a beach wedding, then what better way to add colour than by tying a length of airy, coloured fabric around the chairs. For a vintage themed wedding, this simple and yet gorgeous table arrangement, with its flowers in the wooden boxes and pretty white candles is simply perfect. The blue accents to the napkins that come with the tableware are also a nice touch. For some reason, white just really looks amazingly good on beaches. 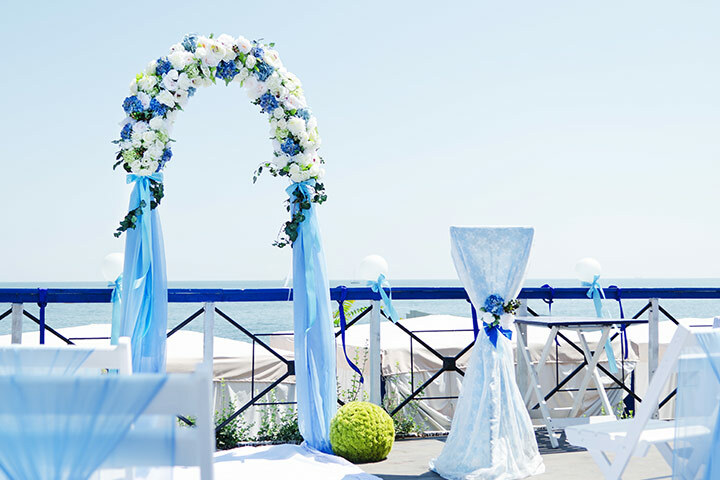 If you want to have a beach wedding, consider using white fabric on white posts to mark the aisle, the arch and seating areas, with tastefully placed floral accents to highlight it all with dazzling colours. You can add colourful and quirky elements wherever you want. This example of coloured marbles held by upturned glasses is somehow perfectly complemented by the origami cranes. Throw is paper streamers hanging from paper parasols are a nice way to lend an airy, breezy feel to your event. You can always add some paper lanterns handing from the trees. Wait for just the right breeze and wait for the magic to happen. Simple paper that is cut out in any relevant shapes and designs can add a simple but unique feel to your wedding. You can also look into the boundless beauties of origami to add a distinguished touch. A network of strings of fairy lights coupled with round, circular paper lanterns is always a soothing sight as they cast their subtle light on the unfolding events.